The power of a serum concentrated into a mask with a second-skin effect, for moisturised and plumped skin in 15 minutes. 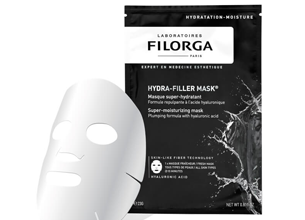 FILORGA has created two superconcentrated masks rich in Medi-Cosmétique® active Ingredients: HYDRA-FILLER MASK & TIME-FILLER MASK, inspired by an iconic FILORGA product. These two ultra-powerful masks using an innovative fibre*, and will come to embellish of all skin types in just 15 minutes. HYDRA-FILLER MASK® brings all the benefits of HYDRA-FILLER®, FILORGA’s leading moisturising cream. Drenched in hyaluronic acid, this infusion mask also contains a combination of NMF-Like complex and aloe vera which actively moisturises and plumps the skin in record time. Double hydration [flash + powerful]: an impregnation formula of hyaluronic acid combined with NMFs – Natural Moisturizing Factors – saturates the skin with water for an intense hydra-plumping effect. Availability: Selected Clicks, Edgars and Red Square stores. I received this sheet mask to trial at the best time – it was a couple of weeks before my wedding and I was battling with dehydrated skin due to winter and stress. The aesthetician said to try and use a hydrating sheet mask at least twice a week on top of my hydrating skincare routine and I was listening, as I really wanted super glowy skin on my big day. This arrived a few days after I’d read up on it and added it to my wishlist, so you can imagine the excitement. And it did not disappoint! It was absolutely soaked in a hydrating and anti-ageing solution, and after leaving it on for the stated time, I then patted any excess solution into my face and neck. It soaked in super fast as my skin was so darned thirsty. But the result was glowy skin for a good couple of days, that didn’t feel so tight and sensitive. Overall a great quick fix, or a great mask to use for a special occasion. If you can justify the price, this would be a nice mask to use once or twice a week, but sadly I can’t as my budget won’t allow that for a once off use mask.